Dive in the pool of our rental house in Tuscany. A villa for your luxury vacation. 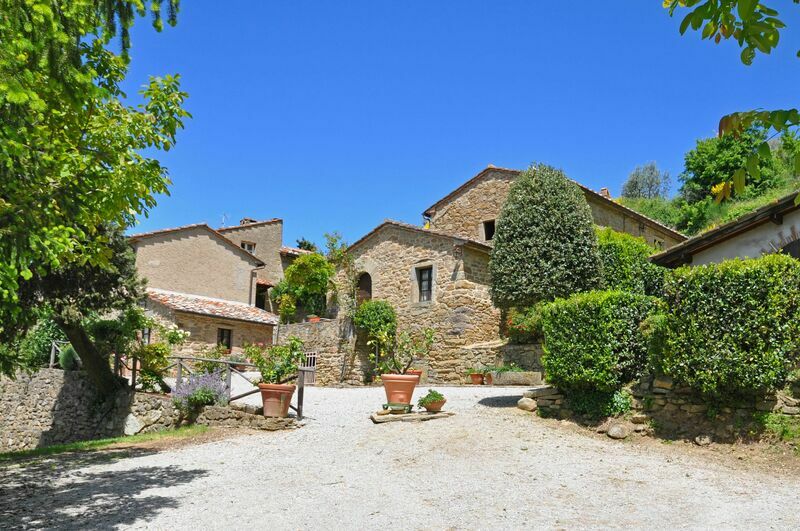 Beautiful medieval stone hamlet situated in quiet and panoramic position between olive trees and woods of ancient chestnut trees, typical of Tuscany. The rental villa has been recently restored preserving its original architectural features and has been divided into 7 nice apartments, all comfortably furnished in typical Tuscany style. Distances: food shop 1,5 km, the charming medieval town of Cortona with all kinds of shops 4 km, Camucia (train station) 4 km, Arezzo approx. 25 km, Perugia approx. 50 km. At guests’ disposal: large and equipped garden, swimming-pool (12 x 6 m – maximum depth 1,4 m – open from 14/05 to 30/09), barbecue. Shared washing machine (€ 3,-/per wash) and iron. Parking within the grounds. Within the rental villa it is possible to pick fruit in season, figs, nuts and chestnuts and to buy the products of the estate (olive oil, jams, wine). Possibility of taking beautiful bike and horse ridings in the woods of Tuscany around the property. Ground floor: living-room with kitchen corner (oven) and dining area, living-room with 2 single sofa beds, double bedroom, bathroom with shower.